Fleming Jenkins announced to their club members that they were closing at the end of the year. 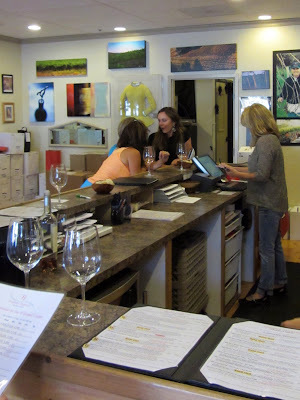 We went with Ted and Shannon to their tasting room in downtown Los Gatos to check out their closeout deals. We drove with Shannon, so a car was nearby for wine transportation purposes (Ted's idea), while Ted walked Sport the five blocks from their house. Sport was not allowed inside, but they said we could taste with him at the tables outside. Ted and Shannon decided he could stay outside while we tasted. Sport begrudgingly waited just outside the door. The tasting room was nicely decorated with plenty of room at the bar. It also included a small gift shop area. 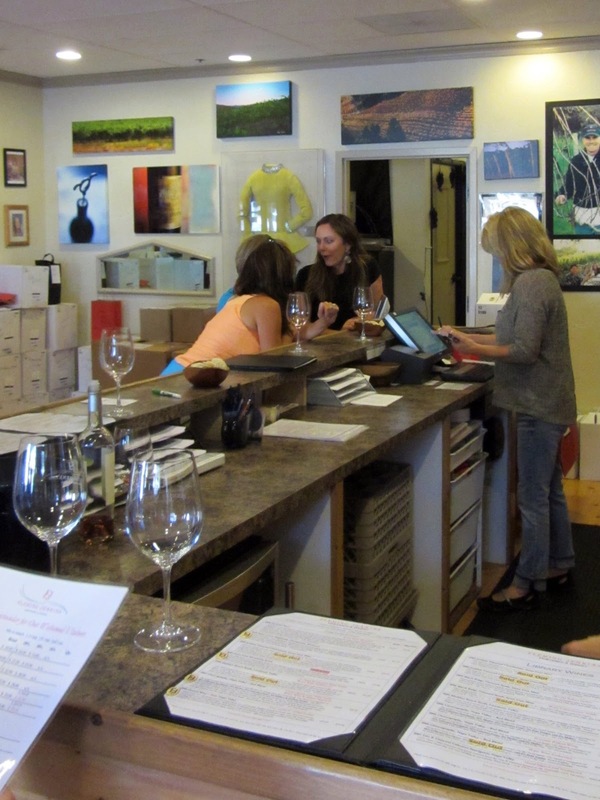 I was surprised to see both the owners, Greg Jenkins and Peggy Fleming, were in the tasting room. I had visited their a couple of times before and had never seen either of them. It was exciting to see them. They came over and introduced themselves to us. They were very friendly. You could tell they were genuinely nice people. Hey, Look, It's Peggy Fleming! They told us how sad they were to be leaving the business, but they wanted to have more time for themselves. Ted asked Greg, who is also the wine maker, what would happen to all the equipment. Greg explained that they made all their wine at Testarossa, and didn't own any equipment. Conversation wandered to entertaining. Greg and Peggy talked about entertaining friends recently where they barbecued salad, and finished the meal up with barbecued watermelon. They seemed to find inventive uses for the BBQ, also telling us about barbecuing peaches with blue cheese. This sounded interesting, though I doubt I could work up the nerve to try it. Afterwards I felt stupid for not getting a good picture of the two of them. At least I got one of these two lovely ladies. We tasted four wines: 2010 Santa Lucia Highlands Chardonnay, 2008 Santa Cruz Mountains Syrah, 2007 Choreography, their scrumptious Bordeaux style blend, and a Port. Everything was very good, except the port, which I can never stomach the sweetness of. The wines were a tad expensive, most at $40 a bottle, but were more in the decent price range with the closing and wine club discounts. They had two other really good Syrahs from Black Ridge and Madden Ranch that we didn't try; I can't remember why these were not on the menu. A number of items were already sold out, which might have explained this. Another reason for going was to pick up some of their Victories Rosé, which both Shannon and Sue love. The wine was created to raise money to find a cure for breast cancer after Peggy was diagnosed and subsequently conquered the horrible disease. I can give or take most Rosés, but I can appreciate drinking this one, since it's supports a good cause. We left with some cases in hand. Sport was glad to see us.